Important: Mobile providers may overwrite the phone number you have set in module settings. In many cases recipients can see only the central number of their provider as sender, or just simply “MiniCRM”. Because of this, you will not receive any answer messages from these customers. A mobile number can contain hyphens, slashes, brackets and spaces as well. If the system considers it a valid mobile number, you can send messages to it. An SMS message is priced at 18 HUF / SMS (gross) to Hungarian mobile numbers. Messages longer than 160 characters are sent as more messages. Maximum 300 characters can be sent. As default, SMS messages can only be sent to Hungarian mobile numbers. If you want to send messages to numbers of another countries’ mobile network operator, contact a CRM consultant. After the free trial expired and you have paid your first invoice, you have to activate the SMS Sending function in every module. To do this, go to the Settings > [Modules] page as an admin and click on a module. Step 1: Enter the mobile number into the SMS sender field. Step 2: Click on [Activate] [1.1.]. Step 3: In the Mobile activation window, click on [Send validation code] [1.2.]. Step 4: You will receive a code in an SMS message that has to be entered into the Validation code field. Step 5: Click on [Activate] [1.3.]. If the background of the number turns green, the number was activated successfully. After that, the number entered is displayed by default when an SMS message is sent from a module of MiniCRM. The recipient’s reply will be sent to that number. To send custom SMS messages, go to a client’s card and click on (SMS) next to a mobile number in Contacts. 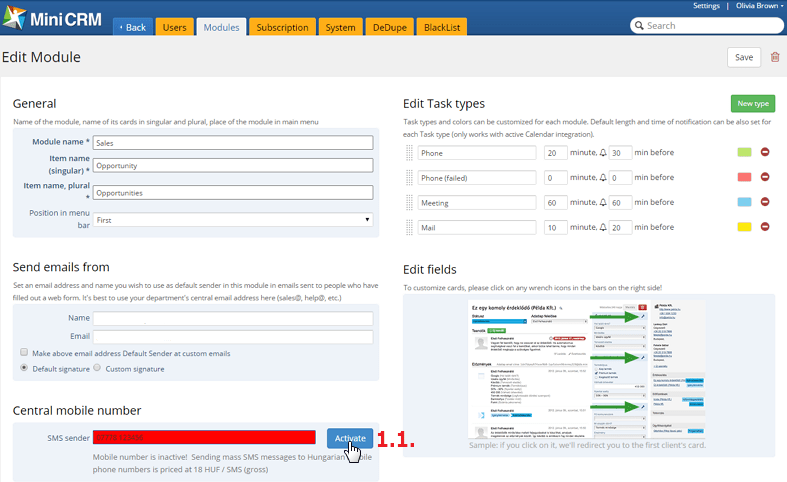 Then select one from the Task and SMS templates or write an SMS by clicking on the [Custom SMS] button. Before sending, you can rewrite the template because the original won’t be affected by these changes. Mass SMS messages can be sent to clients’ default mobile number by using saved filters. To do this, load a saved filter, click on the [SMS] button [2.1.] and choose one from the Task and SMS templates. It is also possible to send messages automatically to clients’ default mobile numbers. It is possible to set users as the sender of SMS messages. In case of follow-up sequences, you can set a salesperson, who is responsible for a client, as the Sender of SMS messages sent automatically. So messages will be sent from the selected user’s mobile number and the recipient’s reply will be sent to that number. Firstly, go to the Settings > Users page as an admin and click on a user’s name. However, users can also activate SMS sending themselves on their own Profile page. Step 1: Enter the mobile number into the Cell phone field. Step 2: Click on [Activate] [3.1.]. Step 3: In the Mobile activation window, click on [Send validation code] [3.2.]. 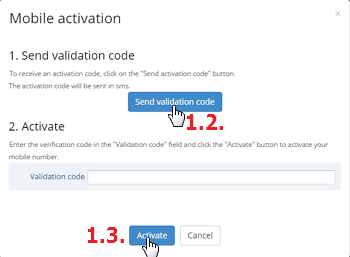 Step 4: You will receive a code in an SMS message that you have to enter into the Validation code field. Step 5: Click on [Activate] [3.3.]. If the background of the number turns green, the selected user’s number was activated successfully.